The decision to award this year’s Nobel Prize for Physics to three astrophysicists who, through measuring the brightness of distant supernovae showed that the expansion of the universe is accelerating, is simply the highest possible confirmation of what most if not all in the field have accepted for a decade or more. That idea is a decisive break from the cosmology I was taught in 1987 – then the argument was whether the geometry of space time was circular (ie., the big bang would be followed by a big crunch as like a ball thrown in the air,eventually everything fell back to the starting point), parabolic – ie., the expansion and mass were in exact balance and that at an infinite time in the future the expansion would halt – or hyperbolic, with the expansion too fast for gravity to eventually halt or reverse it. What has been honoured today does not directly affect these three choices – presumably the expansion could accelerate and then slow and then reverse – but the theory seems pretty clear – the acceleration and the “dark energy” (code for “we don’t know”) that is causing it means the space-time will not stop expanding. 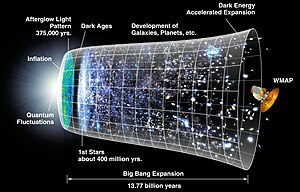 So, does this mean our universe is a “one shot deal” – began with the Big Bang and extending for ever? Not necessarily. Designing experiments to deduce what might have existed before the Big Bang is obviously very difficult (how can you find out what happened before time began?) but there are physical (as opposed to meta-physical) theories and arguments about observational evidence. Roger Penrose‘s Cycles of Time has one theory (though I’ve not got that far yet) and I have seen Neil Turok on TV outline another (an aside: I don’t now Professor Turok, but I used to know his parents who were leading anti-apartheid activists and members of my local branch of the Labour Party – small world, very big universe).